How Do Cats Behave When They're Predicting an Earthquake? Cats act anxious and seek hiding places when they feel an earthquake coming. Reports have been around for centuries claiming that cats and other animals knew long before the humans did that an earthquake was coming. If your cat starts behaving oddly -- even for her -- take note. The Earth just might be on the verge of shifting. If you've never experienced an earthquake, or at least not one with a cat at your side, you might wonder what the "odd" behavior is that people say occurs anywhere from a few hours to a few days before seismic activity. Human members of cat families have reported an array of behaviors, ranging from whining or excessive meowing to acting anxious, frightened or disoriented. Some cats run away, as if looking for a safer place to ride out the trauma, even taking their kittens with them, if they have any. Knowing when an earthquake is coming, especially when modern technology hasn't been able to crack that code, is an amazing feat. It's also one that hasn't been figured out yet. Cat parents would like to believe their fluffy little felines are psychic, but that theory hasn't caught on in the scientific community. Some experts say cats have a sensitivity to the Earth's magnetic fields that lets them know when trouble is on the horizon. Others speculate that more than a sensitivity to magnetic fields, the ability is a sensitivity in general that allows cats to feel smaller tremors that occur before a larger earthquake that humans aren't aware of. Although there is an abundance of anecdotal evidence that cats have foretold the coming of an earthquake, there is no actual scientific evidence. The closest thing to scientific proof was an experiment conducted by a California geologist in the late 1980s and early 1990s. Jim Berkland predicted two earthquakes in California by tracking lost pet ads in the newspapers. Berkland's theory was that cats who knew there was a disaster on its way would run away from home to escape the coming catastrophe, and increased lost cat notices on the two occasions led him to predict the earthquakes. Yet even with experiments like Berkland's on the books and with cat families' testimonies, science continues to be skeptical, reasoning that cats act odd even on normal occasions but that no notice is taken until after the fact if a tragedy occurs. You've probably already noticed that your cat is an expert at reading your body language and will know if you're getting up out of your La-Z-Boy to feed her (in which case she'll beat you to the kitchen) or to pill her (in which case she'll hide before you've even gotten your posterior off the seat). Cats' amazing abilities don't stop at predicting your next move or the Earth's. 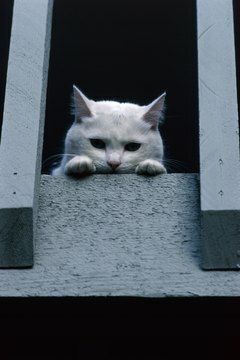 Cats have been reported to have tracked their owners over thousands of miles, even to places they've never been before. And in her book on communicating with cats, J. Anne Helgren tells how Japanese fishermen and sailors would look to cats to predict the weather, even taking them on the ships so they'd be the first to know if a storm was coming their way -- a very handy advantage to have in the days before radios and the Weather Channel. What Does It Mean When a Cat Bites You So It Hurts? How Do Cats React Before an Earthquake?